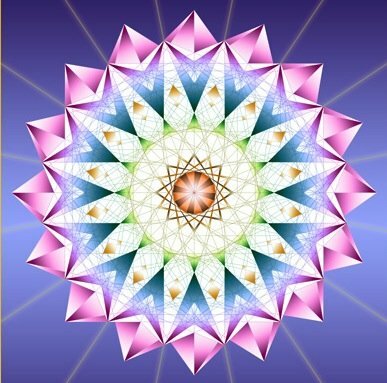 is an international lecturer on Sacred Geometry and Vedic Mathematics. He has taught thousands of children all over Australia in his program called Mathemagics that teaches the translation of Number Sequences into Atomic Art. His book The Art of Number is a comprehensive summary of all the rare da-vinci-code-like patterns and sequences that constitute a new model for mathematical education, a step towards the creation of his Sacred Geometry University, currently being made available online. I will also be having a RETROSPECTIVE ART EXHIBITION of a sample of my murals for the last 30 years. They will be exhibited for the whole month of July. I will be teaching in Maleny from Wednesday the 2nd July till Sunday the 6th July. Workbook supplied, 30 pages, bound. The True Value of Pi, explores a shift from the disHarmonic traditional value of Pi (3.141…), the Circle-Square relationship, towards a new and corrected frequency (3.144…), based on the Phi Ratio (1.618…) that will take Humanity to a Higher Physics, as predicted in the Billy Meier prophesies. Our Mathematicians for over 2,000 years have fallen prey to a fundamental error in the logic of mathematics, posed originally by Archimedes. In the new realm of Fractal Mathematics, we discover that the True Value of Pi (JainPi) must be other than we anticipated. Jain’s beautifully animated powerpoint presentation shows the depth of and wisdom of 30 years avid research. For every lesson, please bring your own pens, lead pencils, colour pencils, rulers, erasers, compass, A4 notebook.